When driving around Saint Paul, your family car engine needs clean air to burn the fuel – and it needs a lot. In fact, a typical vehicle needs about 216,000 gallons of air for every tank of gas. All that air passes through a filter that catches the dust and dirt. Eventually the filter gets completely full. Because the filter can only hold so much, dirt starts getting through. This dirty air passes through the mass airflow sensor, and starts to accumulate on the delicate sensor element. The mass air flow sensor measures how much air is getting into your engine. When the airflow reading is incorrect, your family car engine doesn't get the proper amount of fuel. It runs rough and doesn't perform as well as it should. Of course, that dirty air keeps on going through to your family car engine where it’s burned along with the fuel, which dirties up your combustion chamber and increases harmful exhaust emissions - not a good thing for Minneapolis air quality, not to mention our lungs. When your cheerful Mr Tire Service service advisor brings out your dirty air filter and recommends a replacement, remember the cost and poor performance that can be waiting for you down the road if you neglect this simple Mr Tire Service service. 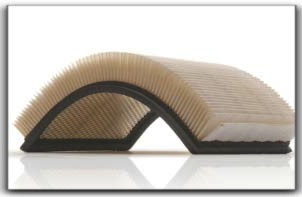 Ask your Mr Tire Service adviser if it’s time to replace your engine air filter. Mr Tire Service in Minneapolis has been providing quality auto repair services for Saint Paul motorists for 8 years. Our specialties include engine air filter, power brake service, and used car inspection.